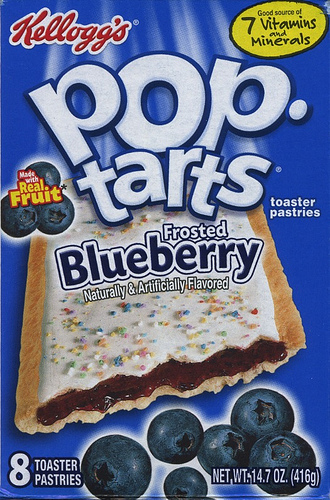 This post is filed under Blueberry, Dry, Hall of Fame (Taste), Kelloggs, Poptart, Toaster. As good as they are, I can only EVER eat one of the two pop-tarts in the silver pouch. Pop-Tarts are what is right with America. Delicious! Want to prevent your kids from getting diabetes? Sign them up for t-ball, soccer and football like everyone else I knew growing up. I’m still healthy and eating Pop-Tarts. Yum. Don’t be cranky because you’re drinking a kale smoothie for dinner. Although we can all agree on your final comment…Buy Pop-Tarts! The blueberries aren’t flying out of it; they’re being chased by the pop-tart which wants to eat them. But it can’t! Because blueberries fly faster than pop-tarts. Pop Tarts are a guilty pleasure in my home too. Too bad it’s not exactly real food. I don’t think they qualify as food. This crap is what’s wrong with America. Want to give your kids diabetes? Buy Pop-Tarts! Pop-Tarts, the perfect hurricane food. Probably also good for snow days when there’s no electricity. You failed to mention that when you turn it upside down that blueberries failed to fall out of it as depicted on the package. So good! I’d choose a poptart over crack any day. Maybe yours were defective? Mine fly through the air. Never was a fan. Generally the only flavors of Pop-Tarts my brother and I accept are either Cherry or Wild Berry. 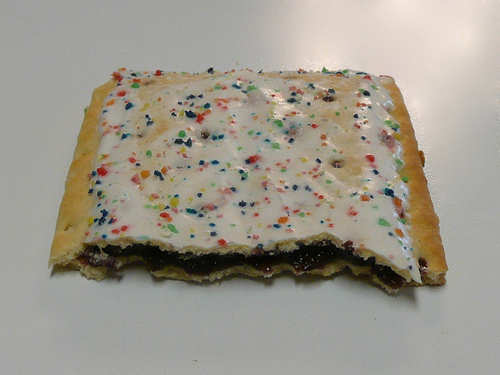 Still, can’t go wrong with a Pop Tart as a breakfast treat, or an anytime-snack. Youre so cool! I dont suppose Ive read anything like this before. So nice to search out any individual with some unique ideas on this subject. realy thanks for starting this up. this web site is something that is wanted on the internet, somebody with somewhat originality. helpful job for bringing something new to the web!